How many guests can the Alumni Center accommodate? The Ruth Garvey Fink Convocation Hall can accommodate 175 to 200 at seated round tables. How much does it cost to rent the Convocation Hall for a wedding receptions and what is included? The rental fee for a wedding reception and dance costs approximately $1,400. What rooms are accessible when renting the Convocation Hall? You will have access to the Convocation Hall, Joss Garden, lobby and first-floor restrooms. The second floor and basement are not accessible unless you rent them. Can we decorate before our contracted time? No. The Alumni Center staff plans around your contracted time and other events held in the building. We will have the facility ready when you arrive. All decorating, deliveries, cleanup and other activities must be done during contracted time. It is the renter’s responsibility to schedule appropriately with their caterer, florist and other service providers. Access to the facility is for contracted time only. Caterers usually require at least an hour of preparation before an event and at least an hour after for cleanup and removal. What’s my first step in renting the Convocation Hall? Contact the university scheduling office. Before paying a deposit, we recommend that you contact an insurance provider. Once you select a date, we will send you a contract with an invoice for deposit. Both are due within 30 days of booking the facility. All remaining fees, an alcohol approval form and certificate of insurance are due 30 days before your event. Failure to provide all the documents will result in cancelation of the contract without notice and loss of the deposit. All cancelations result in loss of deposit. Contact University Scheduling online or by calling 785.670.1725 or 785.670.1707. Yes. You must secure a comprehensive general liability policy and submit a certificate of insurance to the university. The limit for bodily injury and property damage is no less than $1 million per occurrence. This special events liability endorsement policy may be obtained through the agent handling an organization’s general insurance or an individual homeowner’s policy. Are we allowed to serve alcoholic beverages? Alcohol may be served in the Alumni Center, subject to the policies of the university, Alcoholic Beverages Control regulations and the laws of the State of Kansas, Shawnee County and the City of Topeka. Alcohol must be purchased and provided by Washburn Dining Services. The approval to serve alcohol form is part of the contract. Violations will result in loss of the deposit. Under-age drinking is prohibited. An application for approval to serve alcoholic liquor/cereal malt beverages is required to serve alcohol in the Alumni Center at any event. This form must be filed at least 30 days before the events and can be obtained from the coordinator. Non-university groups or individuals serving alcohol in any Alumni Center space must procure and have a comprehensive general liability insurance policy and a liquor policy. You must submit proof of both to the university. Alcoholic liquor/cereal malt liquor beverages may be served and/or consumed at an event inside the Alumni Center and on Alumni Center garden and grounds. Guests found drinking in restricted areas, such as the east side of the building or in the parking lot, are subject to arrest. Guests may park in the lots south and west of the Alumni Center. What is the policy on food service? All food served in the public areas of the Alumni Center must be prepared by Washburn Dining Services. Who supplies linens or table skirting? Washburn Dining Services supplies them. What size tables does the Alumni Center have? We have 5-foot round tables that seat up to eight people. What are we required to clean after the event? Everything you bring to the facility must be removed before the end of your contracted time, including floral arrangements, decorations and food and beverages. The deposit and contract are due 30 days after you book the facility. A certificate of insurance, application to serve alcohol and all remaining fees are due no later than 30 days before your event. Can more furniture be set up during an event, or can we move tables and chairs around during the event? No. All furniture arrangements must be done by staff and arranged before your event. All fire exits, pathways and means of egress are to be kept clear of obstruction, per state and local fire codes. Can we put decorations on the walls? No. Taping, tacking, stapling, nailing, gluing and all other means of decorating on walls are prohibited. Yes, but the sound system must be operated by an Alumni Center custodian only. 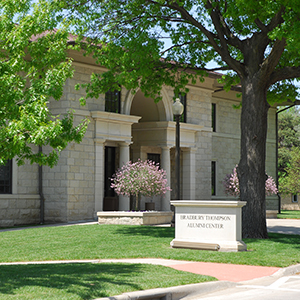 The Bradbury Thompson Alumni Center houses the Alumni Association staff, additional office space for University units and meeting space for Alumni Association, campus and community events.